Fractals and stars are two of the most beautiful and complicated-looking classes of geometric objects out there. 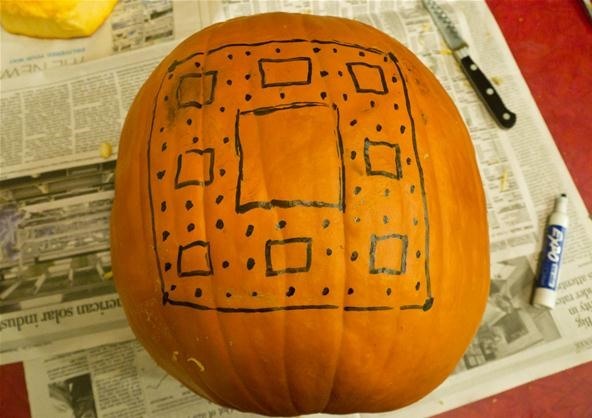 We're going to explore these objects and how to carve them on a pumpkin. 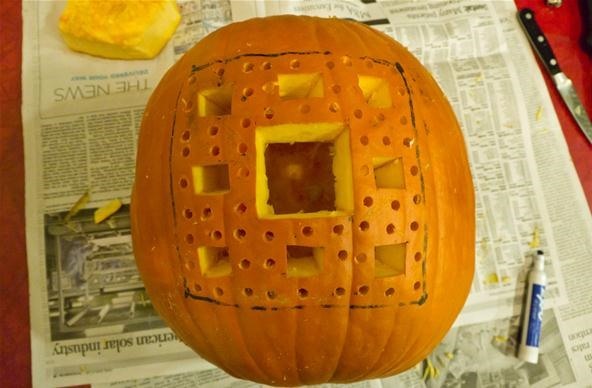 Unlike the last one on carving polyhedral pumpkins, where we used the entire pumpkin to carve a 3 dimensional shape, the pumkin carving in this post will involve two-dimensional images on a small part of the pumpkin's surface. 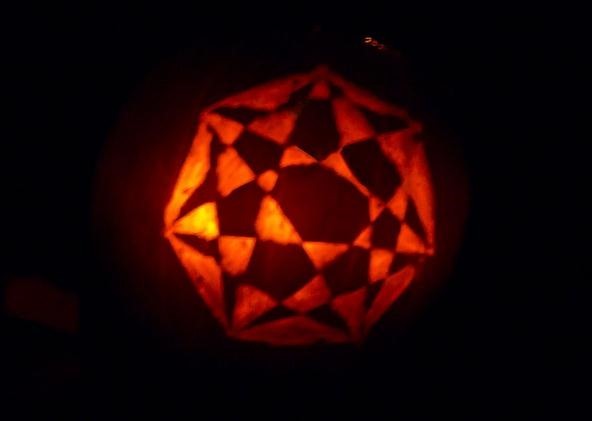 I carved three fractal pumpkins last night. From left to right, the fractals used were the Sierpinski Triangle, the Sierpinski Carpet, and the Koch Snowflake; all fractals which were made out of pennies in this week's community submissions post. 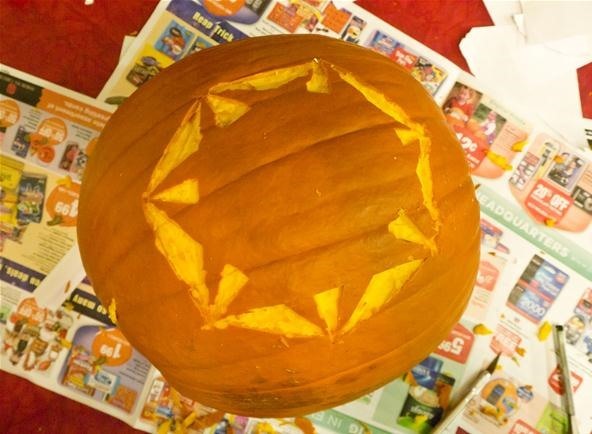 I also carved 3 pumpkins with complex star-shaped objects on them. When carving fractal or star images, it's important to realize that both objects scale rapidly in terms of their complexity. Adding a couple more points to a star or another iteration level to a fractal can make the object take much longer to complete. 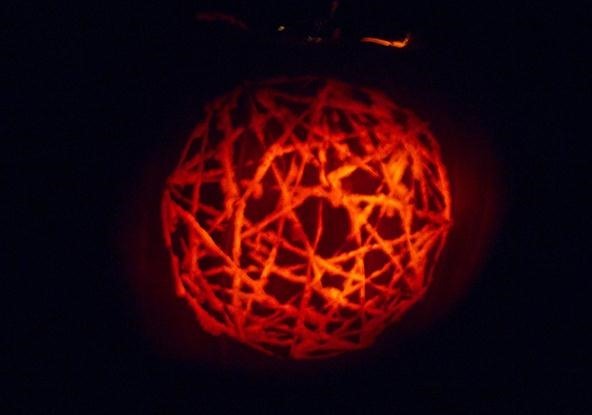 There are many beautiful fractals that would look great carved into a pumpkin. I picked a few of the most well known. To explore others, I suggest the list on Wikipedia and using Wolfram Alpha's page on fractals. When choosing a fractal or how many iteration levels to go, keep in mind that the way the fractal scales is important. Adding a level to the Sierpinski Triangle would add 3 times as many triangles, each having half the length, while adding a level to the Sierpinski Carpet would add 8 times as many square holes, each hole one third the length. 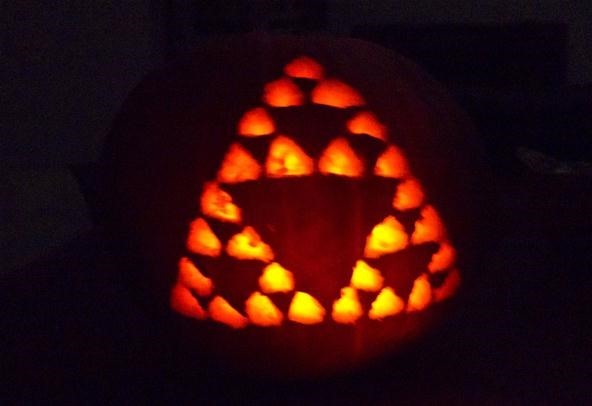 One of the simplest fractals is the Sierpinski Triangle. 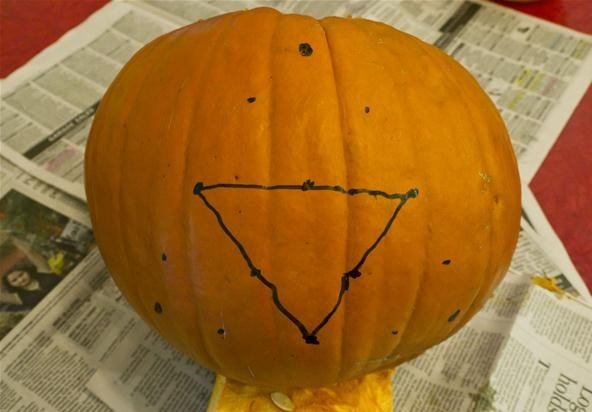 In order to carve it into the pumpkin, you must first mark 3 points. I chose the triangle to be as close to equilateral as possible and marked the vertices with a dry erase marker. 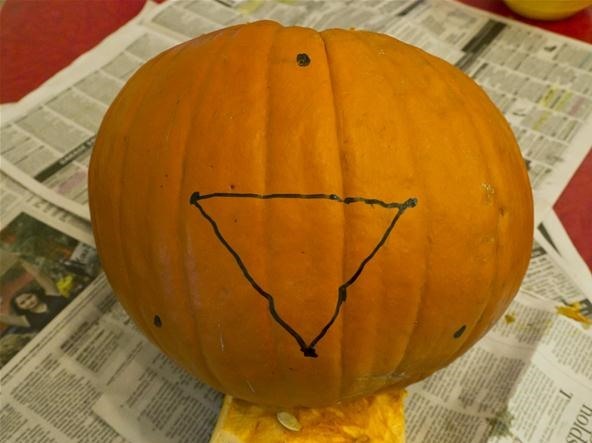 Mark the midpoints of the 3 sides of the triangle. You can do this by eye fairly easily. In this picture, I'm marking the hole in the triangle that will not be modified in the next iteration. I did this by connecting up all of the midpoints from the last step. In the 3 remaining triangles, mark the midpoints. In this picture, I am again marking the holes that will not be modified in the next iteration. You could probably go another iteration further if you like. 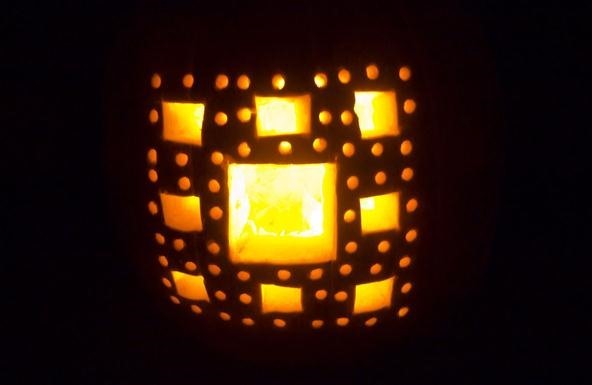 Next, I used a chisel to carve off the outside layer of the pumpkin so that light can come through. 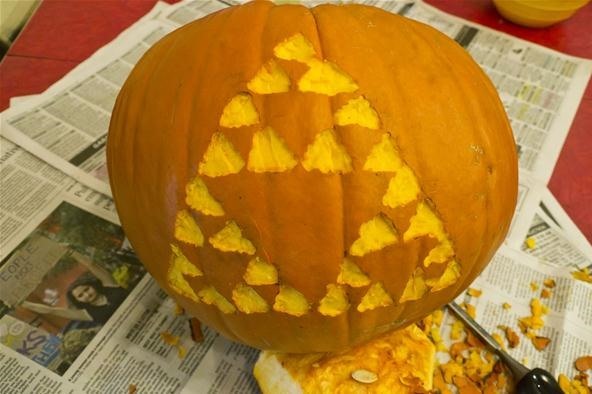 The final pumpkin should look like this when lit. 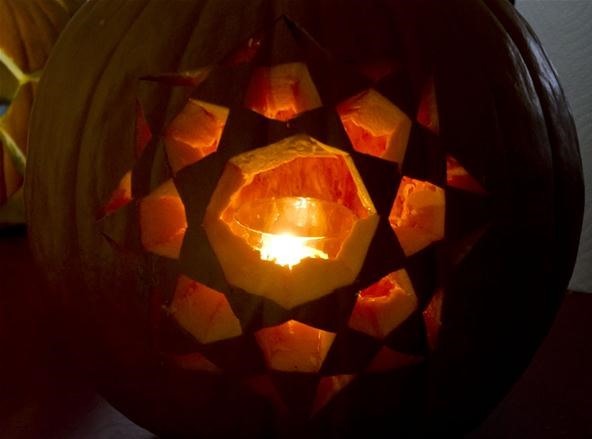 You might have to really scrape the inside of the pumpkin in order to get a lot of light through. 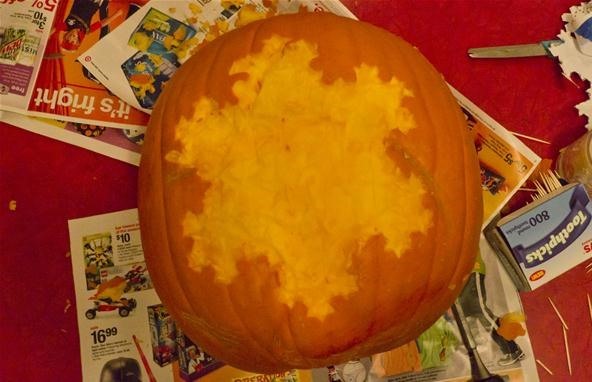 You could also carve this fractal all the way out with a knife, but you would have to be careful to make the connecting points blunt or else there wouldn't be anything holding it together. 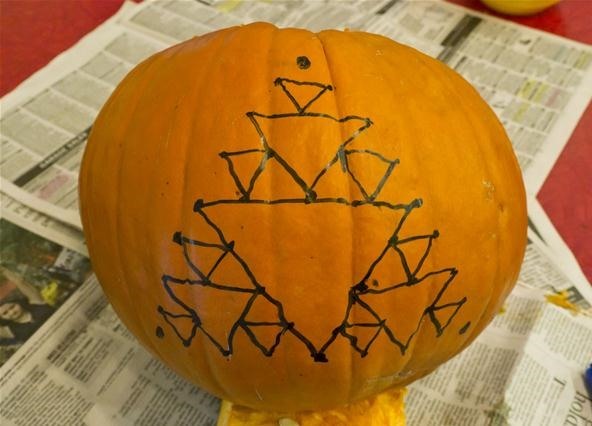 This was probably my favorite fractal to carve, mostly because using a drill on a pumpkin is fast and surprisingly even more fun than I thought it would be. First mark a square by placing 4 vertices and drawing lines between them. 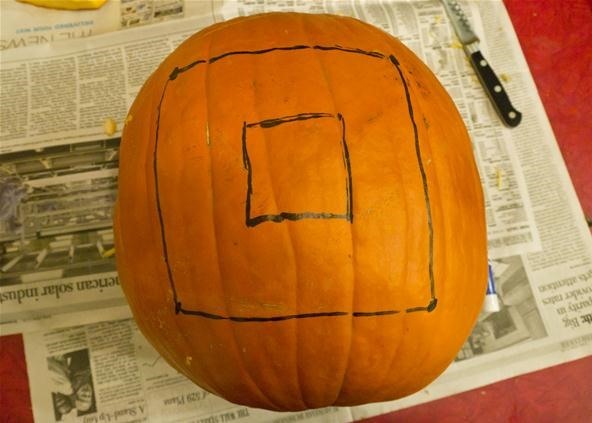 Now draw a square in the middle of that square with sides that are 1/3 as long as the big square. Repeat the last step in the eight remaining squares around the edge of the big square. Repeat. In this step, I just marked the points since I knew I would be drilling them out instead of cutting them. Cut out the larger squares. Drill out the smaller ones. Here's what it should look like when it's done. 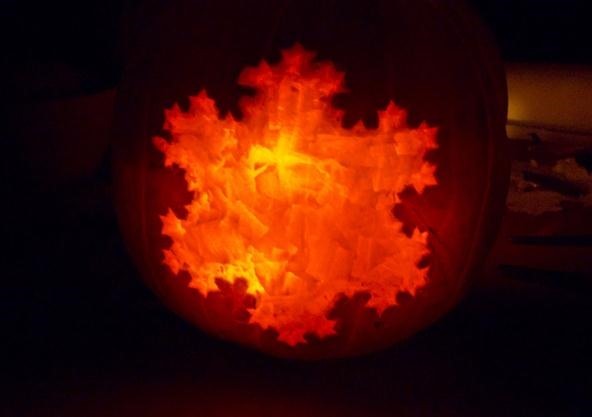 The Koch Snowflake would be a hard fractal to create by hand on a pumpkin. 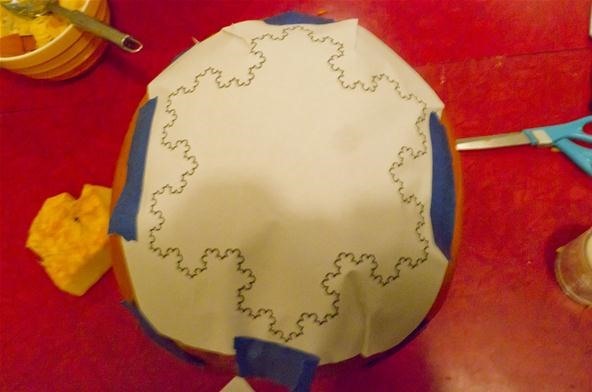 Instead, I went to Wolfram Alpha and typed in Koch Snowflake and then printed out the image below. You could just as easily do this in a Google image search. 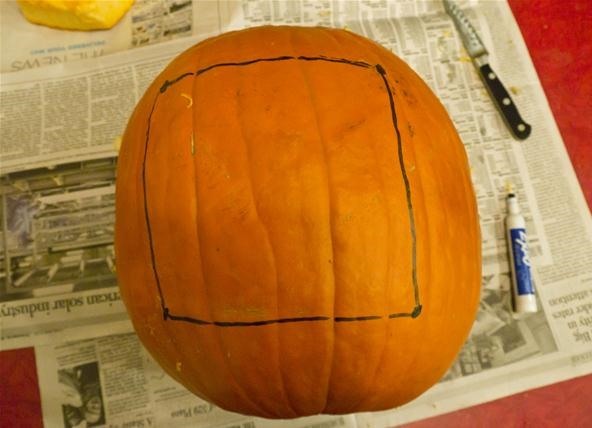 Attach the template to the pumpkin. 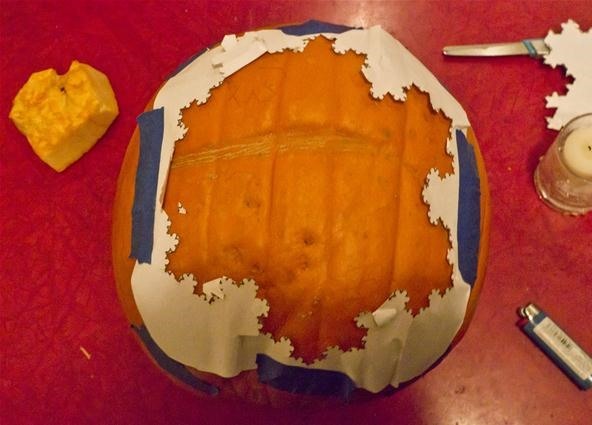 Using an X-Acto knife, cut out the template, making sure to cut deeply into the pumpkin. Don't cut through it completely. This shouldn't be a problem since the blades aren't very long. The image I used was actually one iteration further than I wanted to use, so I cut it out as if it was the previous iteration. Take a small chisel and carve around the inside of the edges. The edges should come out fairly easy and clean, since the X-Acto knife already made the edges. Use a larger chisel to carve the inside of the snowflake if you have one. 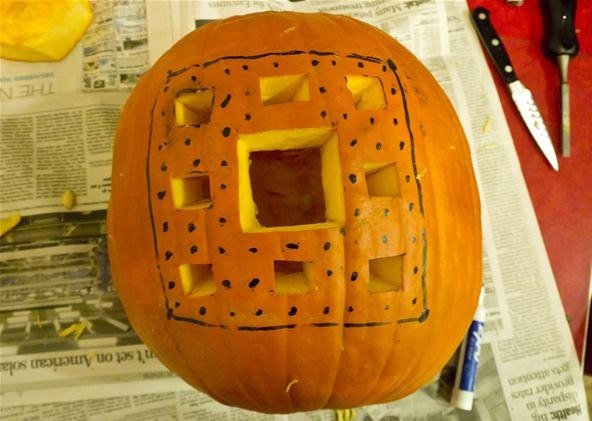 The final pumpkin should look like this when done. 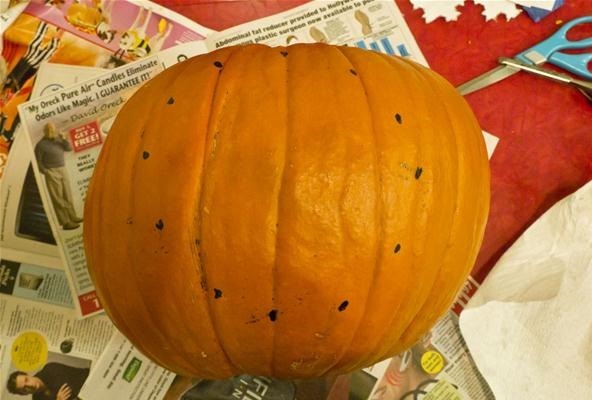 You will probably need to really scrape the inside of the pumpkin in order to let a lot of light through. 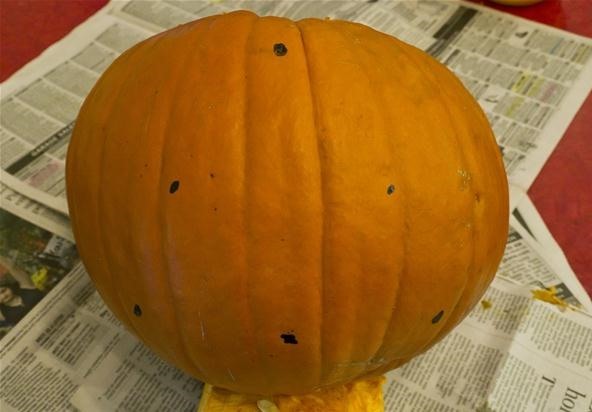 The scraping pattern on both the inside and outside of the pumpkin can be seen. 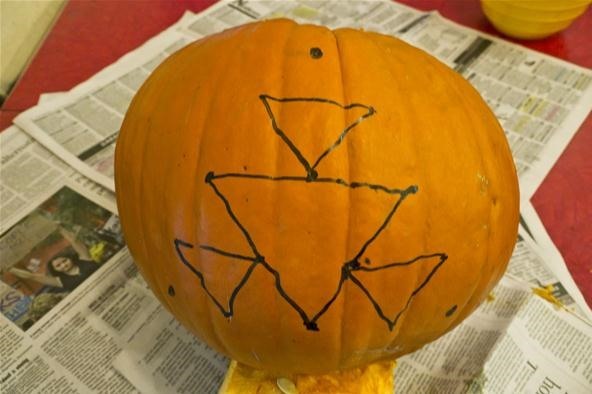 I never knew how to make stars before watching this video by Vi Hart, which is required viewing if you really want to make the star pumpkins in this post. Just like with fractals, it is important to realize how complicated making stars can become. While drawing only one of the multiple types of stars containing a certain number of vertices won't take very long, if you draw all possible stars for a number of vertices, it's then a triangular number and they can get large fast. As shown in the video, the first step to making a star is to make a bunch of points symmetrically arranged around a circle. In the picture below, I picked a few too many points. Here's a picture of this star when I completed it by trying to connect every point to every other point with a straight line. It doesn't look very clean because there are too many lines and too many little errors which really add up here. Another way to mark the points is to use a template. You could find templates by searching for images of regular n-gons. 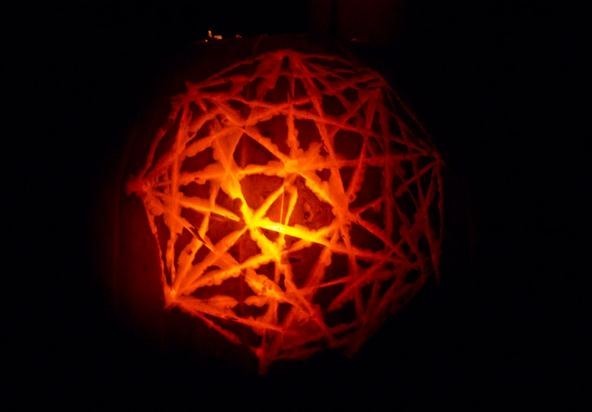 When using the search term regular 12-gon, you should get a picture of a 12-sided object. I obtained the image below using Wolfram Alpha. This image also contained all of the straight lines connecting the vertices. 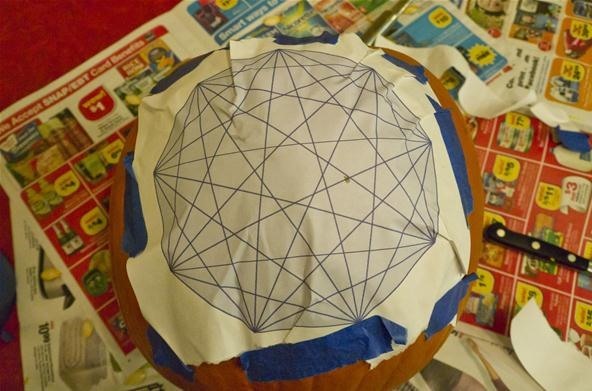 Once you have a template, tape it onto a flat part of the pumpkin. Now you need to mark the points. I took an X-Acto knife and pressed it into the vertices. You can form any particular star by following the method of Vi's video, or you can form all of the stars simultaneously by connecting up all of the vertices to all of the other vertices. Here I am starting to carve the connections by using a chisel. 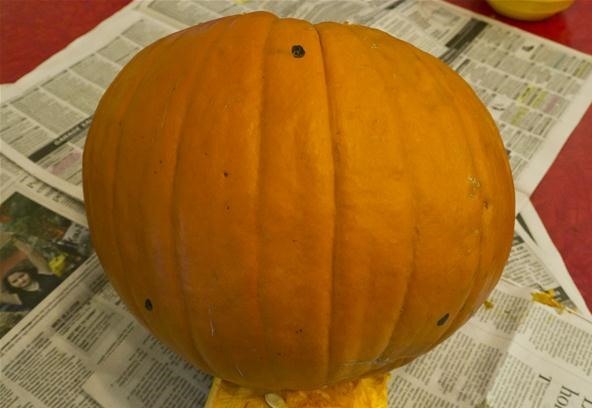 Here's what the final pumpkin looked like. Notice that it is a lot cleaner with 9 points rather than 12. In order to get this much light, you will probably have to do some significant scraping of the inside. Another way to carve these is to take the regions formed by the intersections of the lines and carve them alternately. If you do this, you should make sure to cut the lines first with an X-Acto knife and then use a chisel. The edges should come out cleanly. The finished product. I like the 5-pointed stars that you can see in the 7-pointed star. 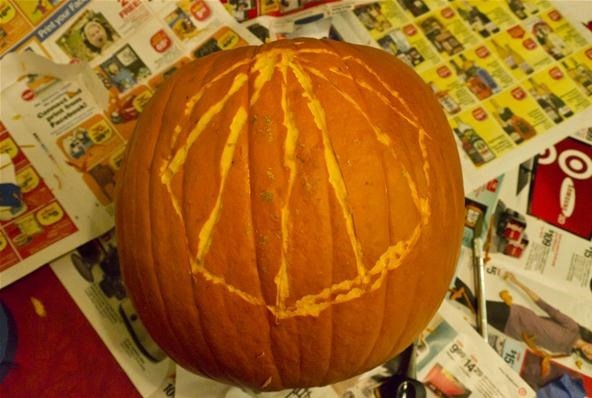 Yet another way to carve these is to actually cut out the sections that I carved into the previous pumpkin. 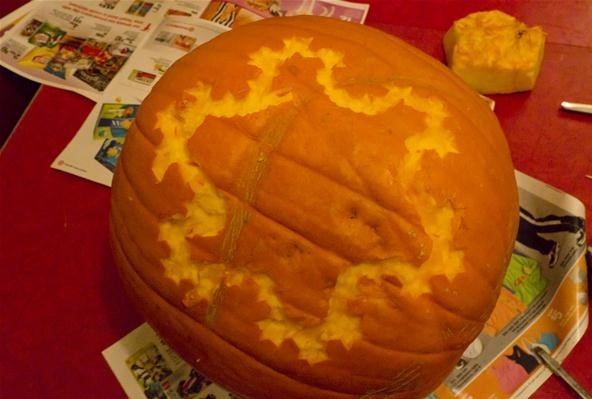 If you do this, make sure you leave some pumpkin left at the corners formed. This is the only thing keeping it together. Here's a star I formed using this method. I started from an octagon and drew all of the connecting lines, except for the lines connecting opposite vertices. I really should have tried creating some single stars like shown in Vi's video. I think something simpler could look awesome, as well. 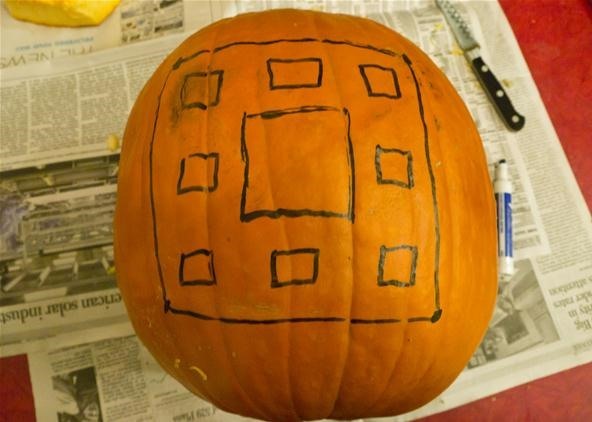 If you build one or all of these—or any other mathematically related pumpkin—let us know by posting a picture or video up on the corkboard. If you have any ideas of how to make these better or faster, be sure to comment. Wow, these look fantastic. Lots of work! I just found a cool star generator.